Thumri is considered to the most evocative of classical forms that give expression to the supreme emotion of love in all its colours and dimensions. Thumri evolved from the Radha-Krishna cult was further sophisticated in the feudal courts by courtesans. The word ‘thumri is derived from thumak, or the beat and sway of dance. This form has all the elements of core classical music, yet gives the artiste immense freedom to improvise and articulate the words of the lyrics in myriad ways. Thumri has many sub-style from the lyrical poorab-ang of Awadh and Benaras to the more rhythmic and structured bandish-ki-thumri, which is closer to the drut khayal. 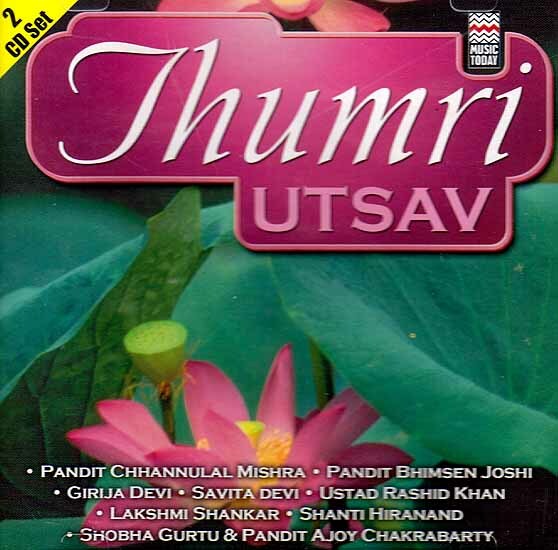 Thumri Utsav celebrates all the various nuances of this genre with some of the popular voices of our times, such as Pandit Bhimsen Joshi, Pandit Chhannulal Mishra, Ustad Rashid Khan, Girija Devi, Shanti Hiranand, Lakshmi Shankar, Savita Devi, Shobha Gurtu & Pandit Ajoy Chakrabarty. Utsav, derived from a Sanskrit word meaning festival, symbolizes celebration. In this album of light classical music we celebrate the glory of thumri, the romantic ang of Hindustani classical music. ‘Thumri Utsav’ is a 2-volume album, where the first volume features all the popular male singers & the second volume features all the popular female singers of this genre, exploring the various nuances of thumri.